environmental adjustment, organismal adaptation, and augmented life realization. innate striving for perfection of the personality and identity of the self-I am into Self I AM. In Paper 10 the anatomy of the Paradise Universal I AM presence, and its relationship to the macro- and micro-universe, has been discussed. It has been stated that the same Paradise principles, because of the universe inter-connectivity, are applicable to all phases of the universe including PUMA’s of the evolutionary worlds. the extensions of their absolutonic”microscopic lines” of forces. In Paper 11 the description of two ultimate states of the physical matter, i.e. two types of physical atomic structures, were described by clairvoyant theosophists. …” (Physical ultimate) Atom is sphere, slightly flattened, and there is a depression at the point where the force flows in, causing a heart-like form. Each atom is surrounded by a field, formed of the atoms of the four higher planes, which surround and interpenetrate it. making to itself a whirling wall of this (undifferentiated) matter of this matter (plane). The wall belongs to space, not to the atom. The atom has…three proper (independent) motions of its own. and has up and down wobble gyrations. If it is made to vibrate as a whole…it will give one of the seven colors (at its frequency)”. “As the words “ultimate physical atom” must frequently occur, it is necessary to state what we (authors, theosophists) mean by the phrase. Any gaseous chemical atom may be dissociated into less complicated bodies; these, again, into still less complicated; these, again, into yet still less complicated... After the third dissociation but one more is possible; the fourth dissociation gives the ultimate physical atom. This may vanish from the physical plane, but it can undergo no further dissociation on it. again, i.e. vanishes from the physical world. The one is like a spring, from which the water bubbles out; the other is like a hole, into which water disappears. pointed end in a CLOCKWISE (CW) direction. polarity currents within male type PUMA . they represent negative, non-dominant polarity currents in a male type PUMA. flattened top in a COUNTERCLOCKWISE (CCW) direction. dominant polarity currents within this female enantiomorphic (mirror image) PUMA. and they represent negative, non-dominant polarity currents in a female type PUMA. through its differential choosing between the “inner” spirit and “outer” matter stimuli. The name SOUL is derived from the root SOL (SUN) hence its name- SOLAR. and controlled by the physical (energy) controllers (PC’s) of the planetary realms. Each soul has IDENTITY and PERSONALITY. permanent ultimatonic center of its physical I am-self and later spiritual I AM-Self. called the (PUMA) central solar atoms in the “secret chamber behind the (physical) heart”. bacteria to the animal kingdom- surviving first early evolutionary species, in a collective differentiation of planetary life, which have failed subsequently to develop further. human gender and human family. 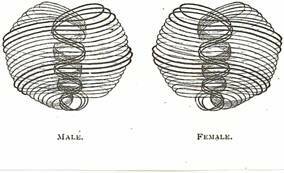 and as directed by Paradise energy, the individualized man needs to act as sexually evolved differentiated “male-form” and as the father of the family, and the woman as sexually evolved, individualized and differentiated “female-form” and as the mother of the human family. the universal scheme of life will not be accepted, and they will be judged according to their merits.